Keep the joy that flowers bring all year long with these beautiful floral liners, the Wilhelmine. 1 inch x 6 inch tiles that are hand crafted from stoneware clay for beauty and durability. Choose hand painted for a vintage touch or choose from our many glazes to match your décor. You don’t have to have the same tile that every one else has! Choose unique, handcrafted tile from Fire Creek Clay today! You can have the joy that flowers bring all year long with these beautiful, floral liner tiles. 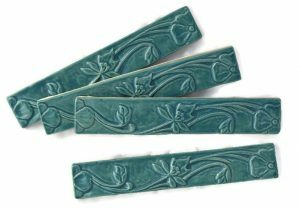 1 inch x 6 inch Wilhelmine floral tiles will add a small touch of personality to your tile installation. Choose a hand painted finish to add a vintage touch when paired with tumbled travertine, or pick one of our many glazes to add a pop of color when paired with subway tile. You don’t have to have the same tile that your neighbor does…choose tile that is meaningful to you! Choose Fire Creek Tiles today!